Brandon Bostick will live in Packer lore as the guy who gave away the 2014 NFC title game. He screwed the pooch. He fumbled the ball. He’s the guy who misplayed the onside kick with the Packers leading 19-14 with two minutes and seven seconds left. He’s Fred Merkle and Bill Buckner, an athlete who will always be remembered for his transformative failure, rather than his success on the field-John Pesky slow to the plate to nab Enos Slaughter in ’46, Ralph Branca’s meatball to Bobby Thompson. 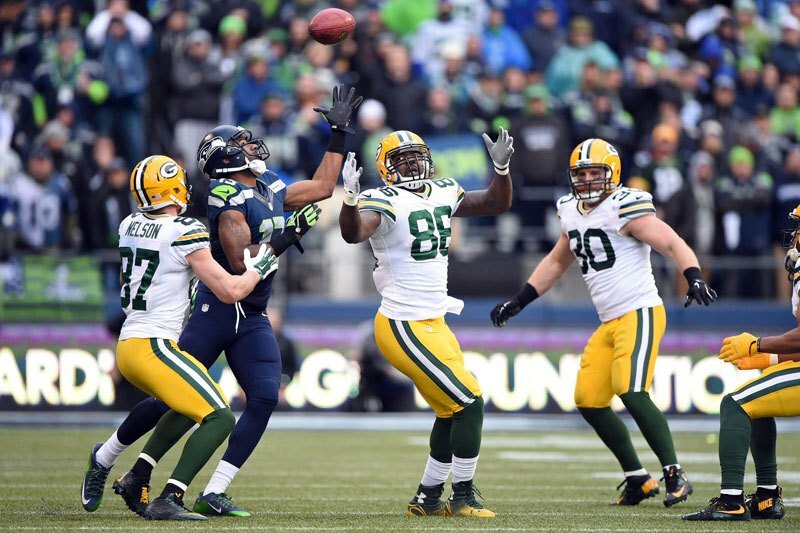 Brandon Bostick will be forever remembered as the guy who muffed the onside kick in the NFC title game. He wants us to remember he’s so much more than that. Bostick was cut early in the offseason by Green Bay. He shares his recurring memories of his moments, the death threats, the numbness he feels when recounting the play in a great piece on SI.MMQB. It is well worth a read if for no other reason than to remember that those we often hate so much when they fail are simply people who desperately want to succeed, to support their teammates and win fan approval. And when they fail, it is simply devastating. Bostick has since hooked on with Packers arch-rival, the Minnesota Vikings, so perhaps there will be some poetic justice with his new team. ESPN gets inside Alex Rodriguez’s head as he ends his year off and prepares to rejoin the Yankees. 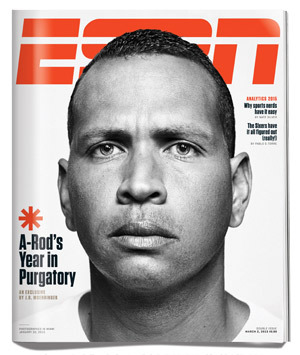 ESPN the Magazine is featuring a lengthy look inside A-Rod and what he has done in the wake of last year’s suspension. It’s all about his efforts to shake up his own view of himself. as he prepares for his return to the Yankees. J.R. Moehringer has done remarkable work to get inside the slugger’s life and paint a balanced, somewhat sympathetic portrait of A-Rod’s recent struggles. I almost began to feel sorry for him. Then I went and washed my brain out with soap. Last year was an incredibly tough year for injuries in major league baseball, especially for pitchers, and the Mariners are right to bend over backwards to protect Paxton, a projected key contributor to this year’s pennant chasing team. But, so far in this early pre-season, other teams have not been quite so lucky. Last year’s Rangers team was utterly devastated by injuries, especially to their pitching staff, but most of the starting lineup was out too. Last week the Rangers announced that all-everything phenom, Jurickson Profar had an unresolved shoulder injury and will have surgery that likely costs him the 2015 season. Profar was the number one ranked prospect in baseball in 2013. It was Profar’s emergence in 2013 that allowed the Rangers to trade Ian Kinsler to the Tigers for Prince Fielder. Subsequently, Fielder ended up playing only a quarter of the season before ending up on the DL. Profar, likewise hurt, ended up missing the entire 2014 season. Fielder should be back, but Profar is likely out. The Rangers, with enough talent when healthy to compete for the AL West, begin their year with a hand tied behind their back. It was announced today that former Mariner, Michael Saunders, suffered a serious knee injury in the first days of spring training. Unfortunately, this one is more severe than Paxton’s fall. Saunders stepped in a soft spot surrounding a sprinkler head in the Blue Jays’ Dunedin, Florida playing field, tearing the meniscus in his left knee. MRI test confirmed the results, and it is unlikely that Saunders, an off-season acquisition for Toronto will return the lineup until the All-Star break. Very tough break for The Condor, a ballplayer I’ve always liked, because he was traded largely because he couldn’t stay healthy and in the lineup. Now the Jays have to scurry and figure out who can play left field as Saunders recovers. Tough on the player, a problem for the team. Yesterday, after announcements that Angels outfielder Josh Hamilton was injured and likely would not start the season with the team, a story rumbled on to my phone that Hamilton was summoned by Major League Baseball for disciplinary reasons. As the evening wore on, it was clear the disciplinary issue was Hamilton’s relapse into drug use. Signed to a five year $125 million deal in 2013, Hamilton has struggled to meet the high expectations this contract carries with it. Suspended for drug use during his minor league career 2003-6, Hamilton re-emerged with the Rangers to become one of the very best players in the game. The five time All-Star, former MVP and silver slugger winner has his status with the league in jeopardy as he struggles to combat the demons every addict faces. Recovery is a long, dark, difficult struggle that never ends. Plenty of addiction among those I love, so he has considerable sympathy from me, but it will impact his team. Though the Angels did pick up Matt Joyce in the off-season, and are blessed with a platoon of very good outfielders beginning with Mike Trout, it will delay Hamilton’s quest to show he is worth the contract he signed two years ago. At least the Mariners begin spring training without a crippling injury as some of their AL counterparts are facing. While I don’t wish these kinds of injuries on any team, enemy or not, hopefully the M’s can get through the pre-season intact and ready to rock the Angels when the season begins at Safeco Field on April 6th. Jesus Montero reported to camp yesterday at 230 lbs. Last year, coming off a PED suspension he weighed in 275. lbs. Exiled to the PCL, the last month of the season he was suspended for an ugly incident in Boise involving a scout, an ice cream bar, and adolescent behavior by both parties. 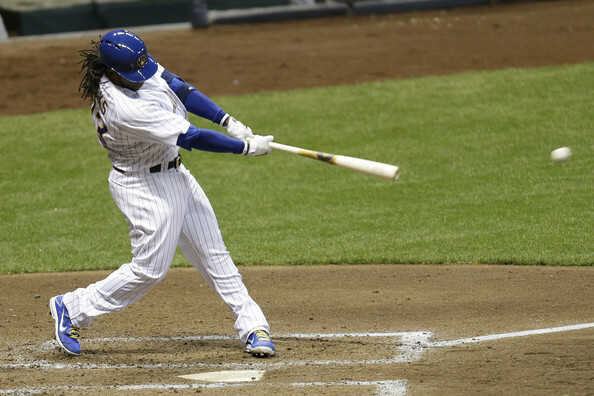 At 24, the player considered the best right-handed hitting prospect in baseball in 2011 was looking at the end of his major league baseball career. Ryan Divish tells the story of yesterday’s press conference with Montero, The big right hander essentially apologized for all of his past failings, and pledged to reclaim his career. It must have been a humbling experience as he faced the press, took responsibility and answered questions. Check out the Divish article for some great backstory on Montero’s training regimen and level of commitment to his redemption. The resurrection of Jesus Montero is a great story. I’m not sure what it means, if anything, in the long run. Somehow it would have to mean he is more than just a big right-handed bat that is equipped to be more than a designated hitter. That position is taken by $57 million worth of Nelson Cruz. The M’s also plopped down $2 million on right handed bat Rickie Weeks, who figures to be pressed into service in lots of different positions. That might leave room for Montero as a back up first baseman, but is that enough? I’m excited to see how this all plays out. I love rooting for an underdog and a redemption story. In speaking of redemption, the Mariners signed left-handed pitcher Joe Saunders to a minor league deal. Apparently they are not satisfied with the left-handed options they have to join Charlie Furbush in the bullpen. Of course you remember Joe, a fixture in the Mariners rotation in 2013. Brought in to replace the traded Jason Vargas, made 32 starts, went 11-16, and was frequently carried off the field on his shield, pelted by 232 hits in 183 innings. That’s a BABIP of .332. Yikes. After being signed by Texas last year, Saunders spent most of last season in the minors searching for the magic. He may still be looking. The Mariners may hope that they can work the same sorcery on Saunders they did on Oliver Perez. Doubt it. They’re different kinds of pitchers, but it didn’t cost much and it’s worth a try. A slimmed down version of Jesus Montero waits his turn to hit. 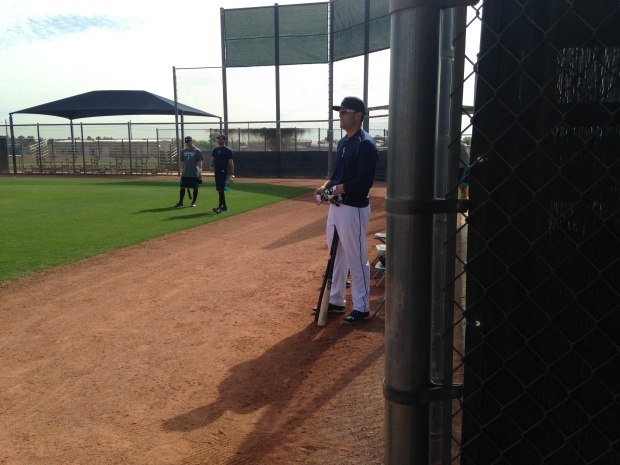 Shared from Ryan Divish’s cell phone, Montero’s weight loss and readiness to play is one of the interesting storylines of spring training. This morning as I was pondering this post (yesterday) and began counting on my fingers, I realized that extra bench spot doesn’t actually exist. (5 SP +7 RP + 1 DH + 4 OF + 4 IF + 2 C = 23 Bench = 2.) This probably accounts for my vocation as history teacher instead of engineer. With the M’s ready to open camp for pitchers and catchers tomorrow, there is lots of excitement and high expectations for the Mariners. And honestly, it’s justifiable. They’ve come off an 87 win season, lost little in the off-season, and addressed important areas of weakness. The Mariners head to Peoria with a much better, more balanced team than any in the Jack Zdurencik era, and perhaps the most balanced, most talented since at least 2003. Last year I complained of rainbows, lollipops and wishful thinking. There is much less of that on this team. Still, there are some important story lines worth thinking about as the M’s leave the hot stove league behind and get down to business. The Fifth Starter. This back end position is definitely there to be won. My guess is that if Taijuan Walker shows consistent command of his pitchers in Arizona, he wins the job. Walker was pretty much the last man left standing in the rotation in September. Iwakuma, Paxton, Young, even the King all faltered, but Walker looked good. But if he can’t consistently throw his fastball for strikes, McClendon won’t have it, and look for him to begin the year in Tacoma. My guess is Elias, who had a good year, and is a good pitcher becomes the ace of the Rainiers staff. Danny Hultzen. Everybody is anxious to see where Danny Hultzen is with his recovery from major shoulder surgery. There is no chance Hultzen breaks camp with the M’s, but he could be one of those future Mariners as we eye the seasons of age 30+ starters Iwakuma and Happ, both on the last year of their contracts. If he’s healthy and effective, maybe we see Danny in September. So many teams were hit hard by severe pitching injuries last year. It’s more critical than ever to have guys down on the farm who can be called up to the big leagues. A key to the Mariners sustained success will be to plug the holes with guys who can win games if one of the starters go down. It’s hard to know how much is enough. You can never have too much pitching. The Kansas City Royals may have had the best trio of pitchers to close out games, but your Seattle Mariners had the best relief staff top to bottom. The M’s lost Brandon Maurer in the Seth Smith trade to the Padres. Lefty Joe Beimel looks like he is out. The big question is how many relievers will McClendon carry? Last year he made extensive use of an eight man bullpen. This year, based on statements by Zdurencik, it seems unlikely the Mariners will carry more than seven. On this list, all the relievers except Rodney and Ramirez have minor league options. Erasmo Ramirez is only 24 years old. He has two seasons pitching at the big league level, and hasn’t distinguished himself enough to break into the Mariners rotation. The M’s will have a tough decision to make–whether to add Ramirez to the bullpen as a long man, or to try to get him through waivers to Tacoma as insurance. He will be claimed; the Mariners will lose him. My prediction is he becomes a long man out of the ‘pen because all the other guys-except Rodney-have options. Mike Zunino, barring a terrible accident or a case of ebola, is the Mariners starting catcher. Establishing himself as a first rank defensive catcher in 2014, this year all eyes will turn to the improvements he must make at the plate to make himself an All-Star. Cutting down on strikeouts, getting on base more, while retaining his prodigious right-handed power gives the M’s an important at-bat near the bottom of the order. The story, and honestly it’s not much of one, is who backs up Zunino 30-40 times per year. Jesus Sucre is a solid major league level defender, without much offensive potential. The Mariners signed lefty hitter John Baker to a minor league deal as a possible platoon for Zunino. Though a seven year major league veteran, Baker’s 2014 slash line .192/.273/.231 slash isn’t likely to scare anyone. It will be an interesting spring training battle to see who wins the backup catcher spot. The Mariners infield is the strength of this team. With the exception of shortstop, it’s perfectly clear who the leading characters will be on this infield. Concerns about Morrison’s ability to stay on field an entire season aside, one of the biggest concerns of the spring is Miller vs. Taylor. My impression, from all I’ve read, is that the job is Miller’s to win. The Mariners like his upside-speed, power, natural athleticism-but he simply has to prove he can do it consistently without being a defensive liability at a key position. Though he had a solid September debut, showing some skill with the bat and making all the plays in the field, the onus will be on Taylor to show the job should be his. Don’t let a big spring training performance influence your thinking. Miller had a brilliant spring in 2014, emerged from Peoria winning the job and fell flat on his face. The Mariners brain trust will be looking for more than a good batting average or some homers.when they make their decision. The Mariners, unable to find an everyday player after trading away Michael Saunders, cobbled together two nice pieces in Justin Ruggiano and Seth Smith to make, what should be, a solid platoon in right field. Austin Jackson is the main story here. After being traded to the Mariners mid-season, Jackson’s performance at the plate plummeted. While Jackson has said all the right things this offseason, about the disruption of the move and his plan to return to form, it simply has to happen for him to contribute to the M’s success. He’s the starting center fielder-there is nobody else in the M’s system at this time who can play the position well. He’s the leadoff hitter, a spot in the order where he’s prospered. He’s one of McClendon’s boys from Detroit, and I’m sure he’ll be given every chance to succeed. James Jones is a minor story here. I’d love to see the Mariners have a guy like Jones on their team, who can steal a base in the late going and go in as a defensive replacement. But despite looking great his first week in the majors, Jones simply could not get on base enough to merit a roster spot. Maybe he’ll show improvement this spring, but he looks like he’s ticketed for Tacoma. It seems like a decade or more the M’s have had to pencil in a black hole in this spot. Cruz will continue his transition away from the outfield and into this role. There will doubtless be times when Cruz and his questionable glove will make their way into left or right, and the challenge will be limiting those occasions. For the first time in ages the M’s look poised to have a meaningful bench. The question is, how big? If the M’s go with a seven man bullpen there will be two spots plus one for reserve catcher. Bloomquist and Weeks means the bench spots won’t be held for a marginal prospect. But there is at least one complication. Bloomquist’s health-Willie had major season-ending knee surgery in August. Will he be ready to go when the season begins? Because he backs up so many spots-1st, 3rd, SS, the outfield-if Willie can’t go, it may mean the M’s will keep the loser of the Miller/Taylor battle on the major league roster. But the question mark is the most intriguing of the spring training stories. This could be the spot they plug in James Jones or someone else. But the most dramatic story of the spring might be the potential redemption of Jesus Montero. Ryan Divish of the Seattle Times wrote yesterday of Montero’s weight loss and the impact it seemed to have on his game. The difference is pretty amazing. Watching him take ground balls, it’s obvious that he moves better. I’m not going to say it’s turned him into a gold glove first baseman, but his footwork has improved and he’s more agile for obvious reasons. As for at the plate, his swing looks much better. It isn’t quite as forced. There is no guarantee Montero becomes the long dreamt of right-handed thumper. But with the re-emergence of an injury-free Michael Pineda as an important member of the Yankees starting rotation, the pressure may be on management to show they got something in return from that trade. Though Montero isn’t an every day player, can he show enough to be a useful bat off the bench, a back up first baseman, an emergency catcher? It all remains to be seen in the magic that is spring training. Ricky Weeks may have been a second baseman with the Brewers. But be prepared to think of him this way–right-handed bat. When the news popped up on my iPad this morning that the Mariners signed Rickie Weeks to a one-year $2 million deal, I was shocked. First, I thought the M’s were pretty much done dealin’, but didn’t see another second baseman as a pressing need. Still wishing and hoping for a right handed alternative at first base, or a little more pitching depth, but the Weeks deal, was completely unforeseen. For those not in the know, Weeks was a second baseman for the Milwaukee Brewers 2005-14. In the past couple of years Weeks struggled with injuries, leaving his production down. He’s a right handed hitter, with some thump and a little speed. His slash line in an injury shortened year was .274/.357/.452. He had a wRC+ of 127. Weeks has good thump against left handed pitching with a .506 slugging pct. in 2014. Weeks is not a good defensive second baseman, with a career -8.9 UZR. So the big question is, what do the Mariners do with him? They have that Cano fellow inked in at second next year and many subsequent years. They also have a plethora of young, cheap, relatively undeveloped middle infielders with Brad Miller, Chris Taylor and down on the farm Ketel Marte. What does this suggest about Willie Bloomquist, in his last year as Mariners Swiss Army Knife? Is he recovered from his serious knee injury? Weeks certainly isn’t here as insurance, because he’s signed to a major league contract and will take a spot on the 25-man roster. It also raises issues around the size of the bullpen. Much less likely to be eight men under Edgar’s Cantina today than yesterday. It may call into question whether the M’s can keep both Miller and Taylor with the big club. But just checking the record, Weeks hasn’t played a bunch of positions. He’s a second baseman. Apparently when the Brewers brought up their new future second baseman, Scooter Gennett, and suggested Weeks learn to play the outfield, he was less than enthusiastic. But that will likely not wash if Weeks is indeed coming to Seattle. Baseball is nothing if not a game of life lessons. Last year Ricky learned how to sit, when a younger, more talented player took his spot. The Mariners signed Weeks as a bat, not to play a specific position. That’s his new role, right-handed role player. Expect to see him take turns at first base and in left field against tough lefties to give Dustin Ackley and Logan Morrison a break. Despite all the complications, and that this move seemed to come out of nowhere, I think I like it. This adds strength to a bench that has been laughably thin for a decade. Weeks is another right handed bat that reduces the M’s recent lefty imbalance. It seems like a good move. In the third quarter defensive lineman Cliff Averill left the field for concussion testing. In the fourth quarter the Seahawks were simply unable to mount a successful pass rush on Tom Brady. Several times he stepped in the pocket and made big passes that ate up Seattle defenders. The Seahawks were unable to defend against the New England short passing game in the fourth quarter. Though the Hawks seemed to have chosen poorly when it came to the fatal interception, both Carroll and offensive coordinator Darrell Bevel were reacting to the insertion of the goal-line defense called to defend against the run. Was it Wilson’s throw? Was it Lockett’s failure to reel in the ball? Was it just a brilliant play by a young rookie? It doesn’t matter, because it’s over. But the ‘Hawks 28-24 loss in Super Bowl XLIX isn’t a simple matter, with easy villains. But there’s always Super Bowl L.
With Pitchers and Catchers Ready to Report, What Have We Got? For all intents and purposes, it looks like the M’s are done dealing heading into Spring Training. That doesn’t mean there aren’t important moves to make, but I don’t think anybody believes the M’s are going to cough up big bucks to sign James Shields or make a deal that brings Doug Fister back to Seattle. Even so, Seattle made several small moves that shores up some team depth in areas of potential concern. On Tuesday the Mariners announced the signing of old friends, outfielders Endy Chavez and Franklin Gutierrez. Chavez is the guy all statheads love to hate because he’s gotten too old to be a great defender and doesn’t walk enough or have enough power to be an offensive hero. Maybe, but he’s filled in well for the Mariners when others have gone down and nobody else was available. We’re on the third or fourth act of “Waiting for Guti,” who has fought half a decade of injury and irritable bowel syndrome. At age 32, don’t expect him to be 2009’s “Death to Flying Things.” Signed to minor league contracts, both guys will contribute to depth at the outfield position. I’d expect one or neither to make the team out of spring training. The M’s also signed catcher John Baker to a minor league deal. It was looking a lot like they were going to take Mike Zunino and Jesus Sucre to Peoria as the major league catching tandem with only John Hicks as a minor league option in Tacoma. Hicks is a defense first guy who played well in AA Jackson last year, but has no AAA experience. Sucre is a good defender and offensive black hole. Zunino can hit fastballs a mile, but is also a strikeout machine. Baker, a veteran of seven major league seasons, offers the Mariners experience and options. So, at this point, the Mariners have filled in some areas where there were legitimate depth questions in case of injury or flame-out by young players. It’s not like they’ve got Willie Mays ready to step in for Austin Jackson if he gets hurt, but at least there is someone with experience. 1. Can Logan Morrison stay healthy and productive enough to be the every day first baseman? In his five big league seasons, LoMo has played more than 100 games once, in his very productive 2011 season with Florida. Last year he managed 99 games and really struggled with the bat until an explosive August and September. The M’s have done little to address the Morrison question, though there are potential solutions with Jesus Montero and untested first baseman in waiting D.J. Peterson. By all accounts, Montero is in good physical condition, but was a terrible first baseman in Tacoma last year. I’m sure the Mariners would like to keep Peterson in the minors this year unless his production shows them they simply cannot. 2. How many relievers will the Mariners carry on their roster? Last year, manager Lloyd McClendon was not shy about populating his ‘pen with as many as eight relievers. For the most part that strategy paid off as the M’s had one of the most stubborn relief staffs in baseball. Today, with Brandon Maurer traded and Joe Beimel unsigned, the M’s are set to return with that same staff largely intact. While the Mariners and Tom Wilhelmson seem ready to swap figures and say nasty things about each other in arbitration, there is little reason to believe this staff will perform as effectively as last year’s crew. Unless, of course, they don’t and become the flammable 2013 bunch. There is talk that McClendon may not keep quite as many guys on the big league roster, which may allow another spot for one more bat on the bench. Four spots vs. three is a big difference and might allow them to keep a Franklin Gutierrez and/or James Jones available. 3. Pete Carroll’s right, competition is a good thing. For the first time in recent memory, the Mariners will have a lot of competition for roles on this roster. Brad Miller and Chris Taylor will duke it out for the starting shortstop role. And they’ll be able to look over their shoulders and see a highly considered Ketel Marte in the rearview mirror. The entire outfield will be under the microscope as Dustin Ackley, Austin Jackson, Justin Ruggiano and Seth Smith vie for playing time. Yes there does seem to be a logical order to this, but DH/OF Nelson Cruz will also likely insist on some time roaming Safeco’s green pastures, and Gutierrez/Chavez/Jones will be looking through the window. How many at bats will Mike Zunino get if he continues to strike out in a third of his appearances? Will Baker, a lefty batter (not to be mistaken for Lou Gehrig or even Miguel Olivo with his 52 OPS+ average over the last five seasons) take some of those at bats? You can write Robinson Cano and Kyle Seager in thick black Sharpie on your scorecard, but there are some legit question marks for the remaining position players. In the rotation, same thing-Felix Hernandez, Hisashi Iwakuma, and J.A. Happ are shoo-ins, but there will be a dogfight between Taijuan Walker, James Paxton and Roenis Elias for the last two rotation spots. Barring injury, that’s a really good place to be. While Steamer and other projections give the Mariners high marks heading into the 2015 season, honestly I just don’t buy it. Those same projections saw the Mariners as a barely .500 team last year. Of course i did too, which makes the projections for 2015 all that much more suspicious. This team definitely has some strengths. The starting pitching is good and deep. The bullpen was outstanding last year. The defense was at least average. The offense wasn’t very good. It seems to me the M’s have addressed some important areas-Cruz at DH is a huge upgrade, and the platoon in right should work. But it’s a team that’s thin. Anything like the train wreck that was Texas last year and Mariners will have a tough season. It’s hard to see how this team beats the Angels, but as some of the Halos’ best guys age, anything can happen. Pitchers and catchers report to Peoria in less than three weeks. Then we’ll get to see the sausage made.